Every so often, I like to contribute to the Twitter discussion #FriFotos. This week’s topic is “bridge,” and I can think of only a few bridges I like as well as the Bosphorus Bridge. A feat of engineering more than a thing of beauty, Istanbul‘s Bosphorus Bridge connects Europe with Asia. When driving over the bridge, there are signs that tell you, “You Are Now Entering Europe/Asia” The change from one continent to another is not immediately evident, but a switch goes off in the head that makes you think: Crossing this bridge is special. 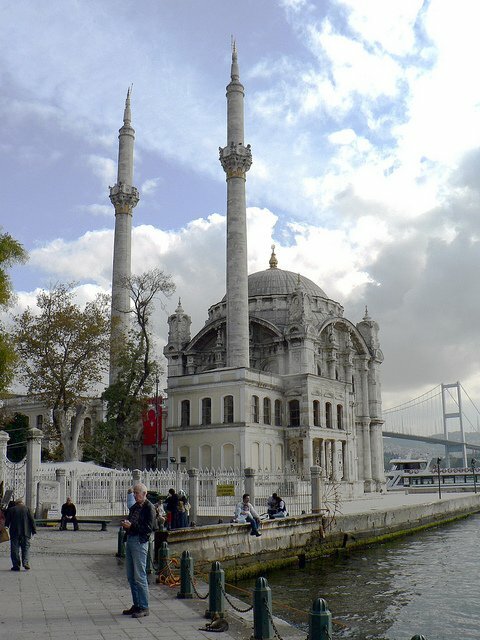 This photo was taken in the neighborhood of Ortakoy next to the oft-photographed Ortakoy Mosque. I highly recommend paying this part of Istanbul a visit.